An eye-opening, funny, painful, and always truthful in-depth examination of modern relationships and a wake-up call for single women about getting real about Mr. Right. You have a fulfilling job, great friends, and the perfect apartment. So what if you haven’t found “The One” just yet. He’ll come along someday, right? But what if he doesn’t? Or what if Mr. Right had been, well, Mr. Right in Front of You—but you passed him by? Nearing forty and still single, journalist Lori Gottlieb started to wonder: What makes for lasting romantic fulfillment, and are we looking for those qualities when we’re dating? Are we too picky about trivial things that don’t matter, and not picky enough about the often overlooked things that do? 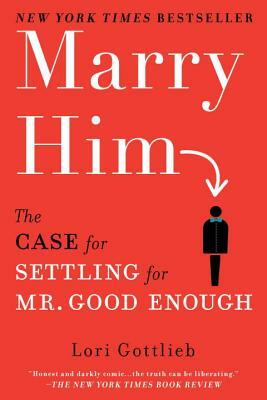 In Marry Him, Gottlieb explores an all-too-common dilemma—how to reconcile the desire for a happy marriage with a list of must-haves and deal-breakers so long and complicated that many great guys get misguidedly eliminated. On a quest to find the answer, Gottlieb sets out on her own journey in search of love, discovering wisdom and surprising insights from sociologists and neurobiologists, marital researchers and behavioral economists—as well as single and married men and women of all generations. Lori Gottlieb is the New York Times bestselling author of Marry Him: The Case for Settling for Mr. Good Enough, Stick Figure: A Diary of My Former Self, and a journalist whose work has appeared in The New York Times, The Atlantic, Time, People, Slate, Self, Glamour, Elle, Salon, and the Los Angeles Times. She is also a frequent commentator for NPR’s All Things Considered.